The F(r)ee Tour is available for individuals (max. 6 persons). 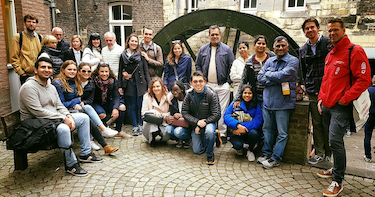 We provide a variety of private tours of Maastricht. Book your F(r)ee Tour here! You can book the tour for up to 6 people. Start exploring the city of Maastricht! To take part of our F(r)ee Tour reservation is mandatory. Sign-up for the F(r)ee Tour and see the availability and dates in the calendar below to let our guides know you are coming! All of the tours start at the Onze Lieve Vrouweplein in front of the Onze Lieve Vrouwebasiliek (church). We do offer a variety of private tours in Maastricht. Please be aware! : The guides retain the right to refuse any person participation of a tour for any reason they deem fit. Children under 14 years are welcome to join a tour provided they are accompanied by an adult. F(r)ee Tour is designed for the individual visitor and not for groups. During the tour it is possible that video recording equipment may be used for recording by our team, which could be used for promotional purposes.